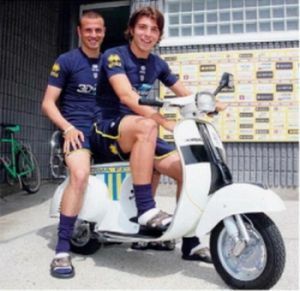 The first 2 new players has arrived: left wing-defender Luca Antonelli and striker Alberto Paloschi, both raised in the youth of A.C. Milan and played with Parma this season. Antonelli already is a Genoa-supporter as son of father Roberto who played with Genoa in the early 80’s before Luca was born. Andrea Antonelli is a fanatic Genoa-supporter with a seasonticket of Gradinata Sud who can now see his brother Luca in the loved red and blue shirt every 2 weeks in Luigi Ferraris. Alberto Paloschi is a very talented striker who scored his first goals in Serie A with A.C. Milan. We all knew that Mr. Preziosi is not happy with the results so far this season. Our succesfull coach and friendly gentlemen Gian Piero Gasperini was fired in November and now there is a little revolution going in the selection of players. Maybe our best player this season, Andrea Ranocchia is sold to Inter that pays € 12,5 million to have our very talented defender. Last summer Inter already spend € 6,5 million to have 50% of Andrea, so Preziosi earns € 19 million and makes a profit of € 14 million in 2 years after paying Frosinone (Serie B) € 5 million in 2008. Let’s hope this money will be totally invested in new players. Raffaele Palladino (rented) and Cicco Modesto (sold) go to Parma and Nenad Tomovic is hired to Lecce. The rumours say that also Houssine Kharja, Franco Zuculini, Gergely Rudolf and probably Mimmo Criscito, Beppe Sculli and Luca Toni will leave Genoa before 31st January. Our topscorer is furious of Mr. Preziosi who gave him in an interview a 3 on a base of 1 tot 10 for his way of playing the first half year with Genoa. Now Luca probably will be the substitute of injured Pippo Inzaghi with A.C. Milan. The derby was posponed by referee Morganti. Now the derby will be played Wednesday 26th January at 20.45 hours (if Genoa and Sampdoria both lose in Coppa Italia) or Wednesday 16th February at 18.30 hours if at least one of the Genovese teams survives the next round in Coppa Italia against Inter (Genoa) and Udinese (Samp). The next match in Serie A of Genoa is Thursday 6th January at 15.00 hours in Luigi Ferraris against Lazio. Party 12,5 years G.C. A’dam: let’s beat Samp ! 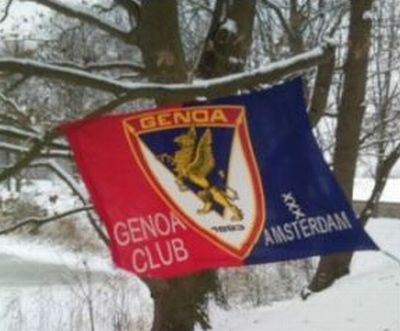 Genoa Club Amsterdam was founded at Tuesday 15th June 1998, so 12,5 years ago. In this period we visited 10 derby’s with 4 victories. Let’s hope that today we will be again the winner of the lighthouse-derby. 1 Eduardo, 88 Perin, 73 Scarpi; 25 Boakye, 2 Chico, 4 Criscito, 3 Dainelli, 22 Destro, 71 Jankovic, 13 Kaladze, 11 Kharja, 20 Mesto, 77 Milanetto, 23 Modesto, 24 Moretti, 10 Palladino, 18 Rafinha, 16 Ranocchia, 7 Rossi, 17 Rudolf, 9 Toni, 42 Veloso. Only the 4 injured players: Tomovic, Zuculini, Palacio and Sculli are not in the Sheraton-hotel near the airport tot prepare themselves to the most important match of the season. Of course it is never good to lose a match in your own stadium, but if you have to it is better to give the points to your friends than your rivals. 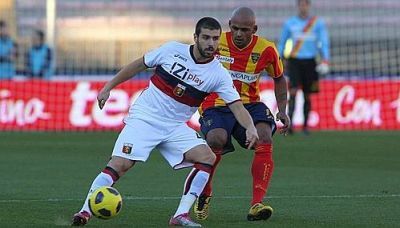 Saturday Genoa played in Luigi Ferraris against Napoli, which is a very strong team this season. Mr. Ballardini started with 5 midfieldplayers including 3 playmakers: Veloso, Kharja and Milanetto. Our topscorer Luca Toni was assisted by Palladino. In the first half Napoli was the best team and in the 25th minute Hamsik headed the openinggoal behind Rubinho: 0-1. In the second half Genoa played a lot better with Mesto and Rudolf instead of Veloso and Palladino in the team. Our team created some chances (Mesto, Destro) and deserved at least 1 penalty (hands of Maggio), but goalkeeper De Sanctis kept his goal clean: 0-1. Now we all count the days till the next match: Sunday 19th December 20.45 hours …. the derby !! In the 76th minute Andrea Ranocchia headed a free-kick of Veloso in the goal of Rosati: 1-2. Of course Lecce tried to score the equalizer in the last 15 minutes of the match, but the final goal was scored by our captain: Marco Rossi after a good combination of Rudolf and Destro: 1-3. Genoa now is 9th in the standings with 21 points in 15 matches. The next match is planned Saturday 11th December at 20.45 hours in Luigi Ferraris against our Napolitan-brothers buth a strike of the players in Serie A probably will cancell this match.